The State Council released a circular on April 12 that laid out the work division across ministerial departments for carrying out the Government Work Report this year. A total of 57 specific tasks, covering 12 aspects, were distributed to main ministries and departments, including the National Development and Reform Commission, the Ministry of Finance, the Ministry of Industry and Information Technology, and the Ministry of Human Resources and Social Security. The report set out a general target for economic growth in 2018, including the GDP growing at 6.5 percent, the consumer price index rising 3 percent, newly added employment in urban areas reaching more than 11 million, the urban unemployment rate under 5.5 percent and the urban registered unemployment rate lower than 4.5 percent. At the same time, fiscal policies should stay positive, said the circular. The fiscal deficit should be 2.38 trillion yuan ($380 billion) with the central government’s fiscal deficit at 1.55 trillion yuan and local fiscal deficit at 8.3 trillion yuan. At the same time, the monetary policy should remain prudent and neutral, it said. 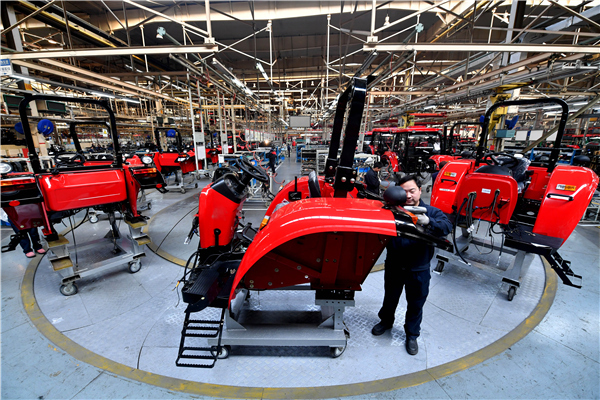 To push forward supply-side structural reform, new driving forces, such as big data and artificial intelligence, should get a boost, as well as high-end industries including 5G and new energy cars, to forge greater manufacturing power. Overcapacity should be further cut, by weeding out 30 million metric tons of steel and 150 million tons of coal. In order to establish innovative power, a national system should be established to spur scientists and technical creativity, and to promote mass entrepreneurship and innovation. The State Council will work to promote comprehensive statistics in the financial sector to enhance services and improve the real economy and the financial regulation system and avoid systematic financial risk, according to a guideline issued on April 9. It was stressed in the guideline that effective statistical coverage of financial activities should be enhanced to cover industry, markets and governmental departments. It seeks to tailor statistical mechanisms for key financial institutions to detect major potential risks, and for financial holding companies to be alert to both intra-group transactions and external risk contagion. The statements of assets and liabilities in the financial sector must be upgraded, involving complete statistics on financial capital flow and stock and the monitoring of macro-economic leverage ratios, and improve statistics on monetary credit, the circular stated. China aims to make the free trade port system and operational mode of Hainan “more mature” by 2035, according to a document jointly issued by the Central Committee of the Communist Party of China and the State Council unveiled on April 14. According to the guideline, which covers supporting Hainan’s efforts to deepen reform and opening up, a free trade port system will be “basically established” in Hainan by 2025. China will also set up an investment fund to support Hainan’s development of a free trade port. The document pointed out that a free trade port is the world’s most open form of an economic zone, which has brought prosperity to places like Singapore and Hong Kong thanks to its broad-based preferential policies on trade and investment. China will support the “all-round participation” of foreign firms in the development of the Hainan free trade port, and multinational companies are encouraged to set up international and regional headquarters there, according to the document. President Xi Jinping announced a decision by the CPC Central Committee to support building Hainan into a pilot free trade zone and gradually and steadily into a free trade port with Chinese characteristics on April 13. China welcomes investors worldwide to invest and start business in Hainan and participate in the building of a free trade port there, Xi said at a celebration marking the 30th anniversary of the establishment of Hainan province and the Hainan Special Economic Zone.